Red means STOP - there is too much text in the text box. - Make the box larger. Highlight the text box. Grab one of the orange ball handles and stretch the box to fit the text (and the rest of your page). Be careful not to stretch that text box over a page margin. - Make the text smaller. Highlight the text box. On the Format button in Page Designer, pick a different font size. You may want to choose a different font face as well, since decreasing the size of the text may make it less clear. This is especially noticeable in script and decorative fonts. - Check the length of the text in the box. If there are extra carriage returns (remember those from typewriter days??) or any extra spaces, the text may not fit the box. Simply edit the text to remove the extra spaces. 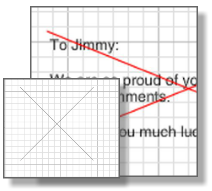 TIP: When you're editing your text, stretch the box much larger than you think is necessary. When you highlight everything inside the box, you'll see any "extras" at the end of your text. Delete these extras and your text should fit. "G" is for GRAY and for GHOST - you have an empty text box. If you're on a Portrait Page, make sure you don't need the text box for Portrait Flow! Highlight the text box and press your delete key. You can always place a new text box if needed.